So we arrive at the place and headed inside. Wow, for such a relatively big restaurant, the tables were spaced out quite spaciously. 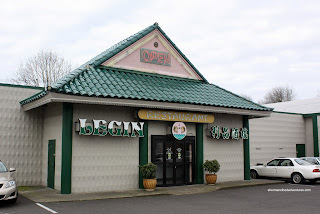 Unlike the restaurants in Vancouver, one could actually do cartwheels in between the tables here. On the topic of carts, this place is really ol' skool. From the decor, to the push carts, all the way down to the food. 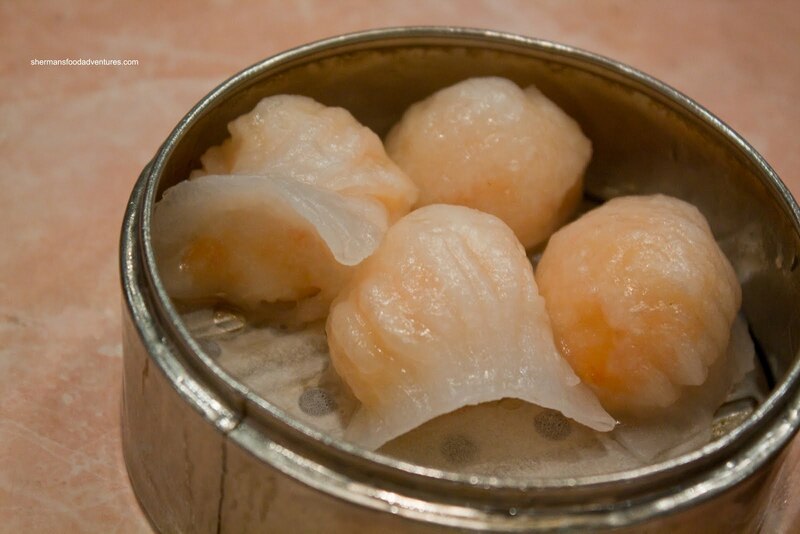 We started with the 2 staples of Dim Sum - Haw Gow (Shrimp Dumplings) & Sui Mai (Pork Dumplings). I would say these were pretty average haw gow. The dumpling skin was quite thick and chewy while the shrimp inside was a little overdone and didn't exhibit that snap texture we normally see. With that being said, it did the job. 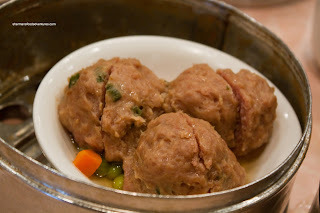 Normally, the sui mai has some shrimp in it; however, these ones were all pork with a bit of shiitake mushrooms. These were also passable with slightly chewy mild-tasting pork. What was not passable were the Beef Meatballs. Egads! These were plain terrible. Viv bit into one and gave me a really funny face. She immediately told me to try one. So I did. Wow, these balls were all wrong. Normally, one would expect the meat to be slightly resistant with a bounce-like texture. Here, it was plain mush. Even mashed potatoes have more texture than these balls. But the worst thing about them was the taste. Viv thought they had the essence of hamburger meat. And yes, there was a certain aftertaste that gave off hamburger meat seasoning. My word. These were very substandard balls. The disappointment didn't end there. The Pork Spareribs were also pretty bad. Typically, these are marinated until they are tender with a slight chew. However, these were far from tender. In fact, they were just plain chewy. Furthermore, there was little in the way of flavour to them as well. It was as if they didn't put anything other than salt on them. Sure, there were a few black beans; but there was no distinguishing flavour. Totally missing the garlic on this one. It didn't get much better with the Shrimp Rice Noodle Roll either. Unlike what I am used to, this rice noodle roll was thick and chewy. 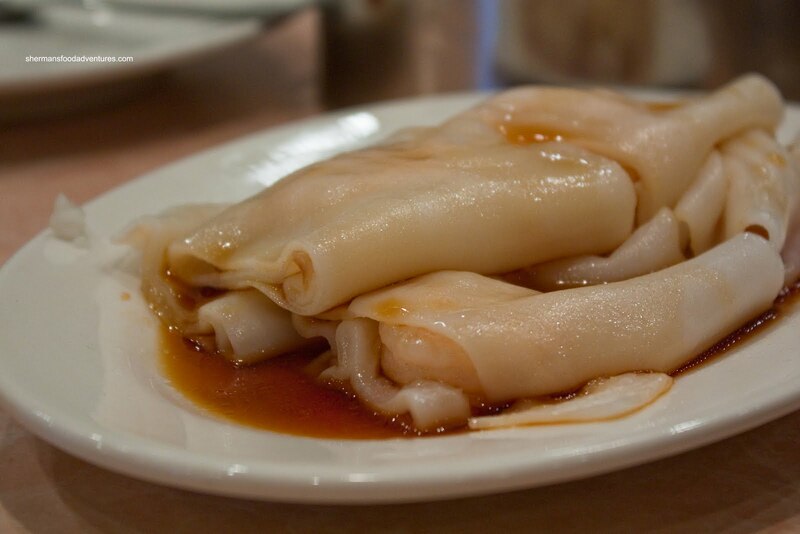 Typically, a good rice noodle roll should be somewhat thin and pillowy soft while still maintaining its integrity. This one was so hard, I could barely divide it with my chopsticks. I had to resort to borrowing the kiddies food scissors to cut it. At the very least, the shrimp was pretty good. It was surprisingly cooked perfectly and had a nice snap. 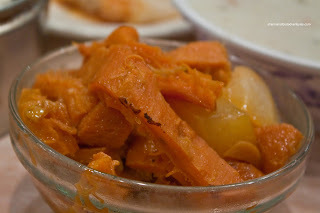 Okay, back to disappointment with the Honeycomb Tripe and Daikon. 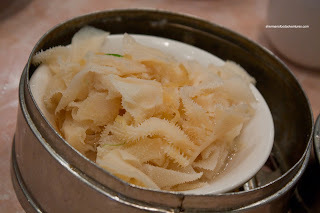 The tripe itself was not cooked long enough; hence it was akin to chewing on rubber bands. I eventually broke it down enough to swallow it; but honestly, that was not fun. Furthermore, it was a bit gamy, which indicates improper cleaning and rinsing prior to cooking. At least that provided some flavour because it didn't have much otherwise. Also devoid of flavour was the Bible Tripe. Yes, I really like tripe and I'll take it any which way, even if it's mediocre. Well, maybe I am going to revisit that belief because the bible tripe was also very marginal. Also a bit gamy, due to a lack of rinsing, the tripe was bland. Furthermore, it was overly chewy once again. Normally, we get the Spring Rolls for my son since he likes crunchy things. Too bad he only eats the outer wrapper. So Viv and I end up eating the filling. That is not really a bad trade-off since the filling can be quite tasty, especially if it is shrimp. Not here. The filling was very dense. Furthermore, the pork was not really all that tender. We basically ended up not eating the filling my son left behind. Despite this, the outside was fried up quite nicely without being oily. I guess my son got it right this time. Another item the kids really like is Congee. They had the usual preserved egg and salted pork congee in a heated push cart. When we started to spoon some of it out of the bowl, we were wondering where is the egg and pork? 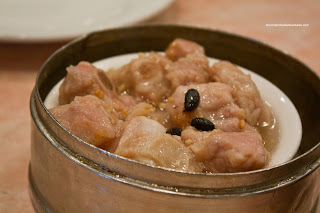 It was there; but the egg had totally melted into the congee while the pork was in little bits no bigger than a Tic Tac. 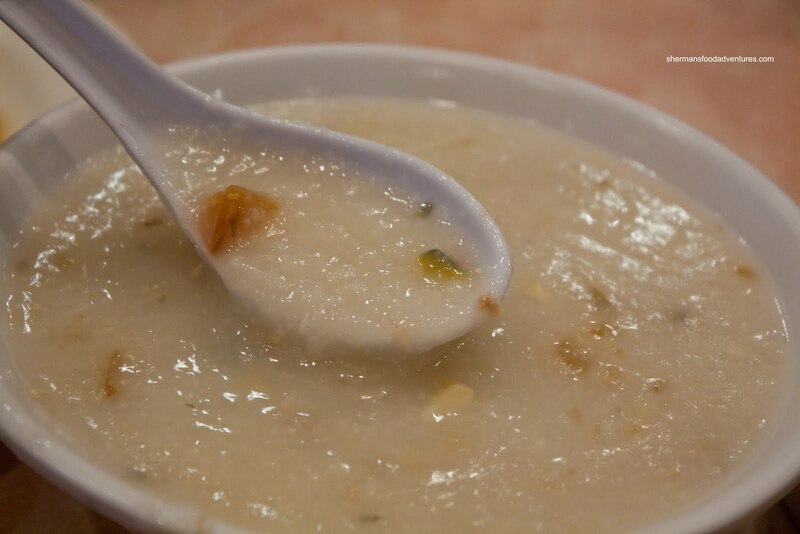 This is very similar to home-made congee where everything is boiled together rather than having a plain congee base, then adding the ingredients. However, the picture clearly shows that there is barely any ingredients at all. Might as well call it plain congee. It was a little on the thin side while exhibiting some flavour. Lastly, we got the Pineapple Custard Buns for the kiddies. There is actually no pineapple in these buns; rather the sweet topping looks like a pineapple when baked. My son seemed to like this quite a lot, so this was not a bad dish I suppose. But honestly. 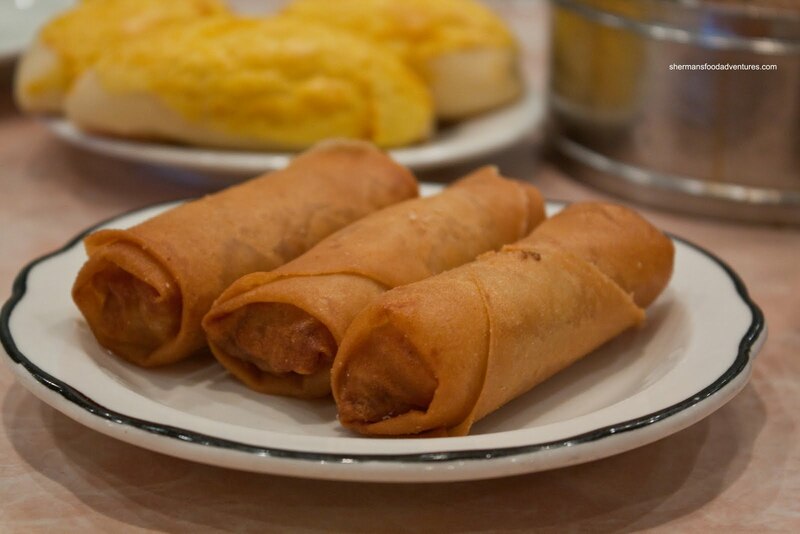 Even for Portland, this is substandard Dim Sum. The experience I had at Wong's King was much better than this. 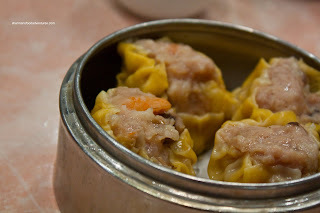 Sure, it is cheaper; but this has to be one of the worst Dim Sum experiences in my life. I do realize that since I am completely spoiled by the wonderful Dim Sum we have in Vancouver, everything else pales in comparison (other than in Hong Kong). With that being said, if we look at the food as a stand-alone, it was poorly executed. Just do yourself a favour and stick with Wong's King.